The Astronomy branch of Macalester’s Physics Department provides a variety of courses as well as edifying facilities for students interested in the study of the universe itself. The Astronomy Emphasis physics major allows interested students to explore both theoretical and observational astrophysics. These classes build fundamental skills that are suitable for graduate study in exciting areas such as planets, stars, galaxies, and the nature of the cosmos itself. The Macalester College Observatory will be hosting a Public Observing Nights series on Monday evenings from 7:00 – 10:00, 28 January through 6 May 2019 (weather permitting). NOTE: A special viewing session of the total lunar eclipse will be held on Sunday, 20 January (before the regular semester starts). The dome will open at 8:00 pm with the eclipse beginning around 9:30pm. 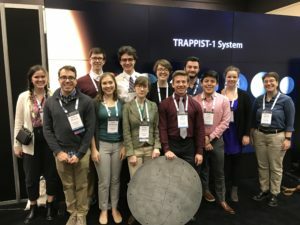 Mac students attended the 233rd meeting of the American Astronomical Society that was held in Seattle from January 6-10, 2019. The students are proudly holding an original plate that was used in the Sloan Digital Sky Survey and that will be permanently displayed at Macalester. Left to right: Catie Ball (’18), Andrew Mizener, Nick Velikonja, Riley McGlasson, Ben Koenigs, Greta Helmel, Lilly Bralts-Kelly, Jacob Hetrick, Josh Bartz, Diego Lopez, Sarah Taft, Alyssa Bulatek. 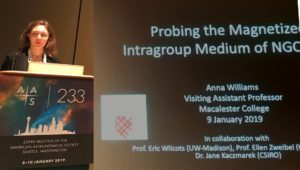 Visiting Assistant Professor Anna Williams gave a presentation at the 2019 AAS meeting about her ongoing research program that studies magnetic fields in galaxies and galaxy groups.